Lunchtime was when all my great school memories were made, whether it was getting a sugar high from snickerdoodles, stalking my crush or sneaking off-campus for coffee. I think a universal anxiety for many minority children is making sure they don’t pull anything embarrassing out of their lunchbox come noontime. In Ohio, I blended in by buying hot lunches from the cafeteria. The only thing that made lunch awkward was that my dad lied about our income so I could get lunch at the reduced price of $0.40, instead of $2.00. Paying became a game of how quickly I could get my coins to the lunch lady, preferably in exact change, so I could speed through without the kid behind me seeing. The food was rotten sometimes, with better days looking like the one below, except I stayed far away from bagged milk and we never had any fresh vegetables. My mother never volunteered to pack my lunch, for which I’m grateful. They would’ve been tupperware filled with soggy leftovers and shrimp with their heads still attached, or healthy food I refused to eat. A whole tomato and a scaly hardboiled egg–that’s a diet I bet she regrets not putting me on. Once every few weeks, I’d have enough of it. I’d whine about not having a lovingly-packed lunch with Dunkaroos or Olive Garden breadsticks like my friends had. My parents, eager to please, would take me to the store, where I bought everything for a normal lunch–deli meat, sliced bread, Capri Sun and chips. After we returned home, I’d pack everything in my neon Barbie lunchbox, appeased but still grumbling. Food was only the half of it–I wanted someone else to prepare it. Maybe write a nice note and throw in a surprise toy. I was quite the diva compared to my lunch standards now. Coffee and trail mix, anyone? If I was honest, I didn’t enjoy any component of American school lunches (except Dunkaroos). Three days later, I’d be past my tolerance level for dry turkey and lettuce. 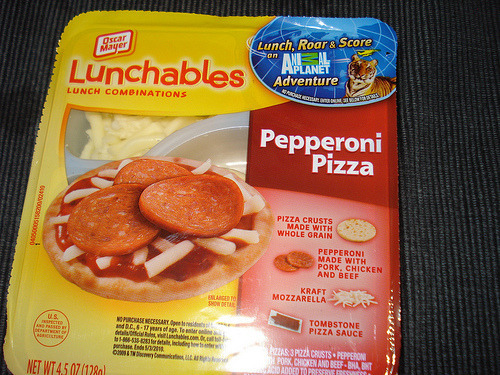 So back to the store we’d go for the Big Kahuna: pizza Lunchables. When it came to lunching in the Midwest, these ruled the cafeteria. They embodied everything about a positive home life, including hip, well-off parents who cared, but not too much. I think nowadays it means your parents are in jail or remodeling the kitchen. It’s marvelous how something that doesn’t taste like food can be appetizing and keep you coming back for more. It’s been about 15 years, but I would eat one of these again in a heartbeat. Just please make sure it’s the pepperoni pizza pack. haha.. I thought it was all about the Lunchables cheeseburger that came with a cola..
good? i’ve never had any other kind!